Gutters just aren’t the most interesting part of your property, but they still need attention! This drainage system is difficult to clean, easy to ignore but so, so important to the running of your property. If you are having a hard time keeping up with kinks in your system, call a Gorilla. A bit of regular maintenance can go a long way with our Sackville gutter cleaning service. When it comes to chores that are higher up, things can get complicated quickly. Without proper stand-offs and safety equipment, your Sackville eavestrough cleaning can be a dangerous endeavour. Grabbing a ladder and positioning it against the side of your property can also cause a lot of unnecessary damage. Your eavestrough system is made tough but it is not strong enough to withstand unnecessary weight pressed up against it. Standing ladders can put pressure on your drain system and break fixtures. Instead of putting your system at risk, call a Gorilla for safe and effective treatment for your Sackville eavestrough cleaning. The most common household method for clearing out gutters is to put on a pair of gloves and working by hand. This might seem like a straight forward process but it is not an effective one. Small items like seed pods or tree needles are nearly impossible to remove by hand. Imagine trying to pick up a cup of rice grain by grain. It would take a long time and it would be frustrating! 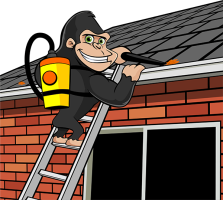 Instead of carrying out your removal piece by piece, our Gorillas tackle your Sackville eavestrough cleaning with tools designed to fit the job. Vacuums are designed to reach both covered and uncovered areas of your drainage system. Before any job is considered complete, your gutters will be tested for free-flowing water to ensure all clogs have been removed.